With its white façade echoing the azure blue of the sea, the Grand Hotel des Sablettes Plage, Curio Collection by Hilton, is a veritable balcony on the Mediterranean that offers a journey back into history. 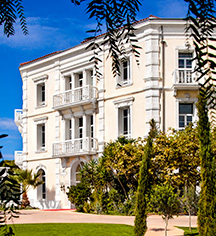 Built on the fortune of Marius Michel, Comte de Pierredon, Chevalier of the légion d'honneur, and Pacha of the Ottoman Empire, the Grand Hotel des Sablettes Plage played host to the prosperity of France's golden age, the Belle Époque, and survived two world wars. After lying dormant for half a century, it was beautifully restored by Stéphane Lelièvre and his family, and now once again entertains guests with all the style and sophistication that earned it prestige in centuries past. Guestrooms are spacious and elegant, while reflecting the hotel’s rich history and spirit. Enjoy complimentary WiFi, a flat-screen TV, and complimentary snacks and drinks while taking in sea views, a living area or balcony, and several suites feature private terraces and whirlpools. Delight in local cuisine while gazing onto the sea at the three hotel restaurants. La Galerie is a peaceful place for breakfast, lunch, and tea, while Le Navigateur brasserie blends seafood and traditional specialties, and Horizon is the perfect place to celebrate a special occasion in an intimate atmosphere. Indulge the senses at Spa NUXE des Sablettes, featuring indoor/outdoor pools, a hammam, sauna, whirlpool, and relaxing terrace, or work out at the fitness center with the latest cardio and strength-training equipment. Plan a meeting in a choice of state-of-the-art function spaces, or host a wedding brunch or garden party on the beautiful outdoor terrace. Take in stunning views and golden sunsets, enjoy direct access to Les Sablettes private beach, and the charming shops and restaurants of Promenade Jean Charcot. Just 15 minutes away is Toulon, which has fascinating museums, such as the Musée Mémorial du Débarquement on top of Mont Faron, an entertaining local street market along the Cours Lafayette, and the beautifully historic cafés at the Place de la Liberté. 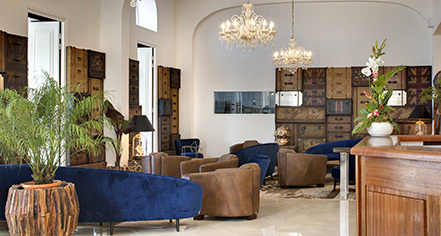 Grand Hotel des Sablettes Plage, Curio Collection by Hilton, a member of Historic Hotels Worldwide since 2018, dates back to 1888. The founder of this historic hotel, Marius Michel Pasha, Comte de Pierredon was a French architect who led the Ottoman Lighthouse Authority and the modernization of the Istanbul harbor, which earned him the honorary title of Pasha from Sultan Abdülaziz. Hotel/Resort Fees & Taxes: 2,09€ per day, per person. Parking: Outdoor self-parking: 9€ per day, per car. Payment: Visa, MasterCard, American Express, and Maestro / Switch are accepted. Pet Policy: Service animals allowed: Yes. Pets allowed: Yes, 8€ per pet, per day; 15kg maximum weight; pet toys and in room dog-house available. Shuttle Service: Shuttle to Toulon runs regularly for 2€. Airport shuttles are available upon request. With its white façade echoing the azure blue of the sea, the Grand Hotel des Sablettes Plage, Curio Collection by Hilton, is a veritable balcony on the Mediterranean that offers a journey back into history. Learn more about the History of Grand Hotel des Sablettes Plage, Curio Collection by Hilton .